Here are my top 8 Bible verses on fasting. Maybe you can think of another one or two. Fasting is strictly a personal thing between you and God and is no one else’s business. If you tell people that you are fasting, they might think you’re boasting about it or they might think you’re acting self-righteously. That’s because we are to fast not to be seen by men but only by the father and this should be done in secret where only He can see it. If you do it to be seen by others, you’ve already gotten your reward and there will be no further. The desire of God for Israel was that they returned to Him before the Day of the Lord and to do so with “all your heart, with fasting, with weeping, and with mourning.” These four signs of true, godly repentance are that the whole heart is involved and that there is an afflicting of one’s soul by fasting in secret before God, and there is brokenness over sin (weeping) and mourning of our depravity before God. It is not easy to fast. When I fast it seems my temper is harder to control and fatigue sets in a lot easier and I have a lot less energy. When some of the ancient’s fasted, they didn’t always do a very good job of it. Isaiah chapter 58 is about true and false fasting. Some do it as a means to try and twist God’s arm into doing something for them. The reasons can be purely selfish. They fast so that their “voice [can] be heard on high” by God but God rejects their reasons for fasting and as such, their voice will not be heard. This verse infers that proper fasting can make our voices be heard by God; it all depends upon our motives. One of the best examples of repentance is from the ancient city-state of Nineveh. This was not just a city but a nation and a powerful nation that was a natural enemy of Israel and had been a thorn in her side for years. That explains why Jonah ran from God for so long but no one can go to where God is not already there. This fast in Nineveh was ordered by the king and so from the “greatest of them (the king) down to the least of them” the entire city-state fasted and by their show of repentance, they stayed the hand of God’s wrath upon Nineveh. Zechariah, in writing to Judah, was calling out the remnant of people and the priests for fasting and mourning but being less than sincere about it. God askes the rhetorical question, “was it for me that you fasted?” with the obvious answer being, no! The time period of this fast may have been on the Day of Atonement, which was a commanded fast for the entire nation and this fast may have come near the end of their seventy years in captivity but apparently, after they were returned to the land, their fasts really meant nothing because God saw no change of heart in them. Nehemiah was very troubled by the news that the walls of Jerusalem were broken down and so his natural reaction to this grievous news was to weep and fast and mourn for days. Apparently Nehemiah fasted for several days at the report about Jerusalem. He knew that this is the city where God had placed His name and it caused him to fall on his face and fast, mourn, weep, and pray to God. So fasting sometimes is done by those who are going through a very difficult time like we see King David fast during the illness of his child (2 Sam 12:15-17). If you have been through a great trial in your life or you know of someone else who has, they often lose their appetite because their grief has been so great that they don’t even think about food. Here we see David afflicting himself with fasting and bowing himself down to God as if he was grieving for a brother or mother so fasting sometimes is automatic for someone who is going through a great loss in their life. In this last passage about fasting, the church was apparently fasting and worshiping God but not because of mourning or grieving. The church must have had regular times of fasting, prayer, and worship and they were apparently so close to God in this mindset that the Spirit of God was actually communicating with them (Acts 13:4) and telling Barnabas and Saul (later, changed to Paul) the way that they should go. If you choose to fast, you should talk to your doctor first because it could cause serious health issues and it could put you and even your life at risk. Not everyone can fast; some can fast only one or two meals and that’s okay because the greatest fast I could ever recommend is that “You shall serve him and hold fast to him, and by his name you shall swear” (Deut 10:20) so that is Who we need to cling to. Fasting can be a useful way to draw closer to God and to show God that you are serious about your prayer requests but it should be done in secret and be between you and God alone. 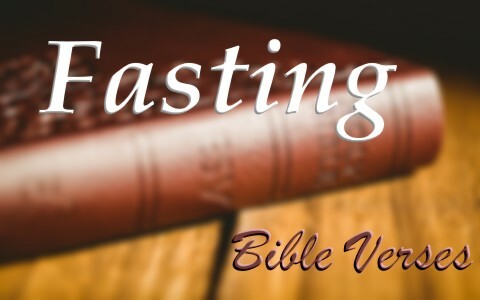 Never undervalue a fast before the Lord because fasting can also show us our total dependence upon God for everything, including our very lives. Next post: Do Colors Have Special Meanings When Used In The Bible?